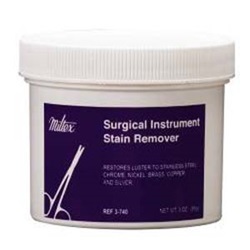 Instrument stain remover powder comes in a 3 oz. jar. The special powdered formula which removes stains and tarnish and restores luster to surgical instruments, autoclaves, ultrasonic cleaners, stainless steel counter tops, etc. Ideal for use on stainless steel, chrome, nickel, brass, copper, and silver. Manufactured by Miltex.